Salzburg (Agenzia Fides) - "The local church and universal church are mutually and essentially linked", said Msgr. Giampietro Dal Toso, Adjunct Secretary of the Congregation for the Evangelization of Peoples and President of the Pontifical Mission Societies, on the occasion of the 50th Anniversary of the diocesan twinning of the Archdiocese of Salzburg in the setting of the "Zukunftsfest" (Feast of the Future) organized by the Archdiocese (21-24 September). On September 21, delegations of the dioceses of Bokungo-Ikela (Democratic Republic of Congo), San Ignacio de Velasco (Bolivia) and Daegu (South Korea) were present at the commemorative ceremony under the guidance of their respective local Bishops. Archbishop Dal Toso spoke on the theme "Universal Church and local Church: communio and missio" and, in this context, he in particular explained the importance of ecclesial communion regarding the universal aspects of the missionary activity. At the beginning of his speech, the Archbishop recalled the special role of the Archdiocese of Salzburg as "Primas Germaniae", thus underlining the importance of the "contribution of German-speaking churches to the universal Church". However, the Archbishop continued, "the Church is such because the local and universal churches are essentially and mutually linked" and "the Church cannot be such if it is not universal and local at the same time". This "spirit" is also expressed in the long collaboration of the archdiocese of Salzburg with the twin dioceses: "Today we have gathered to celebrate a concrete expression of this unity: 50 years of mutual cooperation with different local Churches, because we want to give witness of this unity starting from Christ". In the Church, however, communion and mission depend on each other. "Therefore this is about communion in the mission to the world. The communion of the Church, however, is not an end in itself and must not lead to self-sufficiency", underlined Msgr. Dal Toso. This ultimately translates into the understanding of "communio as missio". On the theme of "missio in the Church", the Archbishop recalled the missionary impulses of the Second Vatican Council and finally the convergence of the idea of the missio ad gentes with the idea of the new evangelization: the Church must "rediscover its missionary impulse" and "this is true for every individual: all Christians must be literally missionaries". 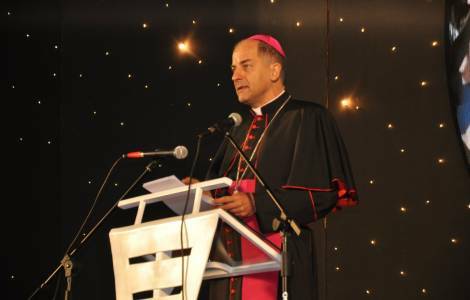 Finally, Archbishop Dal Toso underlined the special commitment of the Archdiocese of Salzburg, "that through prayer, sharing and mutual learning from one another, testify how we live together as members of the universal Church, members of the body of Christ ". This helps "not to lose the vision of the whole mission of the Church". In particular it is important "that missionaries who go from a diocese to another place in the world are not forgotten. May they continue to be supported by prayer and donations, which is the primary task of the Pontifical Mission Societies "because," despite concerns about the specific responsibilities of diocesan twinning, the universal mission of the Church must not be neglected". This is guaranteed by the "Solidarity Fund" which, established at the International Secretariats of the Pontifical Mission Societies, "manages and fairly distributes" the donations collected on the occasion of World Mission Day and, alongside the primary care of the needy dioceses, also supports pastoral and specific social projects. ASIA/SOUTH KOREA - Cardinal Yeom to missionary priests: "Proclaim the Good News of God"